Just a couple of days before NAB 2019 opens its doors to the masses, Sony has started their new product announcements. 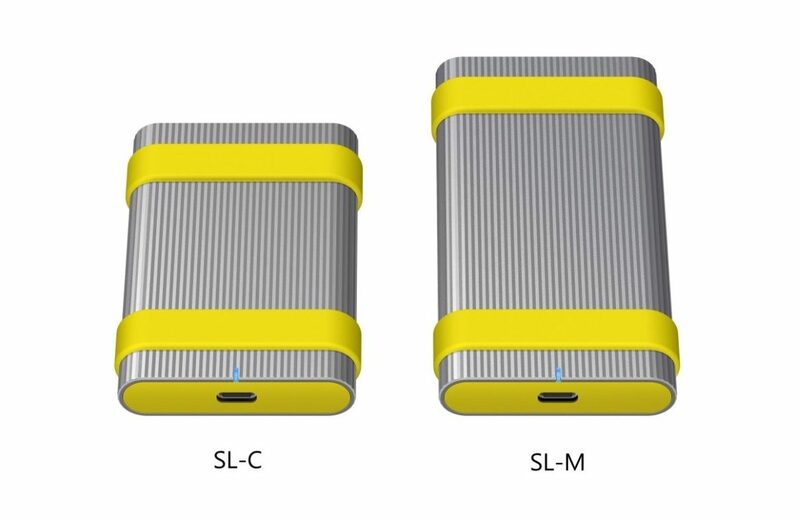 Sony just announced two new external SSD drives, the high-performance SL-M series and the standard compact SL-C series. These external SSD drives are said to be ultra-tough, fast, and feature hardware encryption and new utility software aimed at giving photographers and videographers the peace of mind to know that their data is safe even in challenging environments. The SL-M and SL-C’s high speeds of up to 1000MB/s enable quicker workflow when processing, editing, duplicating and storing data. The SL-M series and SL-C series both feature an innovative one-piece aluminium body with an omni-directional shockproof construction. With an IP67 rating, both series are dust-proof and waterproof and feature a USB Type-C port that is waterproof even without a sealing cap. Data is also protected even if dropped in up to 3 feet of water for up to 30 minutes. These external SSD drives are highly durable and can withstand pressure of up to 6000 kgf and bending of up to 2000 kgf. Additionally, the SL-M series and SL-C series are impact proof, withstanding drops from up to 9 feet. 500GB, 1TB and 2TB capacities. The high performance SL-M series has an outstanding read and write speed of up to 1000MB/s, while the standard compact SL-C series has an impressive 540MB/s read speed and 520MB/s write speed. Both series also feature a USB 3.1 Gen 2 (USB Type-C) interface and the SL-M series is able to achieve incredible high speeds with NVMe SSD technology. Thanks to the latest SSD controller for both models, users can enjoy constant high speed even when working with extremely large data files that are copied or overwritten many times. These ultra-fast speeds make professional workflow more efficient, whether you want to process high resolution photos or 4K videos, duplicate original files to another device or edit a lot of images at once. These external SSD drives include some really helpful features to make sure that your data is always safe, such as Password Protection, which gives users the ability to secure their data can be secured with hardware encryption providing AES 256-bit encryption without any speed decline. Dual Password Protection is supported on the SSD Utility app which is free to download. The owner (administrator) can share the locked drive with other users using just the user password, without having to reveal the administrator password. Plus, with cross platform compatibility, users can set a password to lock from a Mac then open from Windows PCs or Android smartphones, and vice versa. The Lifetime Checker, also available on the SSD Utility app, helps check the condition of the storage drive so the user can be prepared when they’re reaching their limit. Through the SSD Utility app, updates or upgrades can be applied to keep the device working perfectly. File rescue software helps to reduce fear over losing precious data. Accidentally deleted files including RAW or high-resolution videos may be recovered, giving the user greater peace of mind. Both models with be available in 500GB, 1TB and 2TB capacities. The SL-M series and SL-C series will be available later this Summer with pricing to be confirmed at a later date. And while, the announcement of these new external drives is a welcomed one you could rest assured Sony wouldn’t rock up to the biggest industry trade show with just a couple of external drives. The Sony NAB 2019 Press Conference is this Sunday, April 7th at 10 pm UK time/11 pm CET/2 pm PST and you can see a livestream of it over at Sony’s NAB page here.